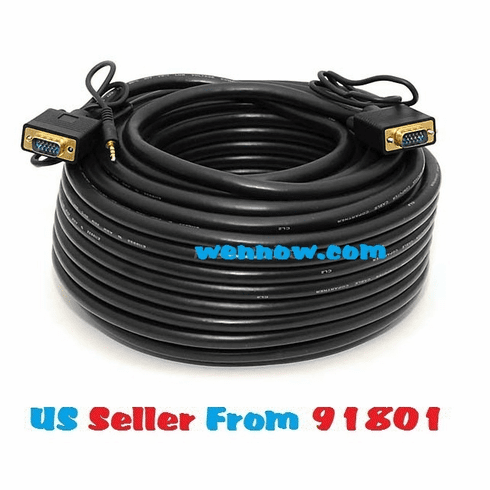 320593942983 PC To TV SVGA HD15 M/M 100ft cable w/ 3.5mm Audio Cable (Gold Plated) Looking for a way to connect both the video and audio from your computer system to your high definition television? These convenient cables save you the hassle of running a separate set of cables just to get sound. They feature a low loss, TRIPLE shielded design to keep out RF and EM interference. They also come with durable molded HD15 connectors with thumbscrews for a secure connection and molded 3.5mm (1/8 inch) mini plugs. Great for connecting high resolution monitors and high definition TVs with PC A/V inputs.